Astons were born into an era of studio design where equipment resources were limited and centralization was the norm. Central VTR and Telecine areas assigned machines to individual studios through a booking system, the theory being that no one area would need continual access to these large and expensive machines. It was all rather like the days of expensive mainframe computers before the arrival of desktop PCs. 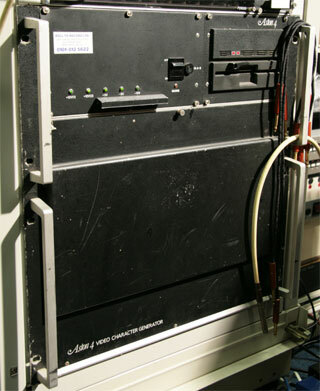 Video and audio feeds were patched around the building via tie-lines, and talkback systems used so that the studio could cue the VT operator when needed. Aston CG machines had to be able to work in this way too, kept in a central area and assigned to a studio or edit suite when needed. 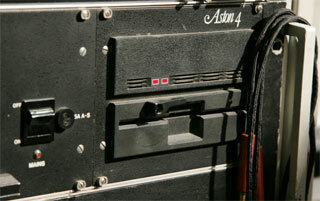 Connecting the video output could be done just like a VTR, but operating the Astons presented a different problem. For whereas the VT operator could be with his machine in the central area, it was less practical to give instructions and script changes to a graphics operator who was not in the control room with the rest of the production crew. As such, Aston developed a way of using standard video cabling to allow communication between their dedicated keyboards and the central Aston mainframe, itself a two foot high rack unit stuffed full of circuit boards. 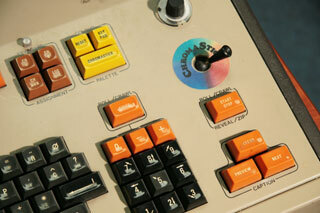 The initial project was to control an Aston 4 to produce a live countdown timer for the Krypton Factor. After that was a more ambitious project for generating snooker scores with statistics. All the operator would have to do would be click on coloured balls on the Amiga screen when the players potted or fouled, and the software would automatically update the score, maintain a "break" total, work out the remaining points available, keep a log of the game, and update the Aston with a current score caption including a graphical representation of how many balls of each colour had been potted in the current break (once a certain threshold had been reached). Unfortunately Granada immediately lost the snooker contract before they'd used the software, but it was adopted by the new operators and in conjunction with Wurmsers (thanks Neil!) it was used for ITV’s snooker coverage for several years in the early ‘90s. I still have an Amiga and more recently bought an Aston to set up a little "technology museum" area, but the keyboard doesn’t work so I can’t log on to the mainframe. 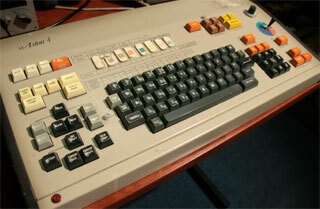 If anyone has an Aston 4 keyboard going spare, or can repair mine, I’d love to hear from them!